Robert: What has been your personal way into Theatre of the Oppressed (TO) or participatory theatre?? How did your passion start to grow? Thamar: I went to acting school but soon I got the feeling that we didn’t work on the real struggles in life; it was a bit superficial. I thought there must be a better reason to make theatre. After that I went to Nicaragua for a scholarship. There, I got to know Theatre of the Oppressed and I thought “Yes, this is what I was looking for!” I heard the name of Augusto Boal and read his books. A few years later, I found out about Formaat. I started working there as an actress, later on I started jokering. The more I learned about the work, the more I got inspired by it. I think TO is a really beautiful way to deal with the issues that are part of the community. Luc: 25 years ago I came from Belgium to live in Rotterdam. I got a specialization, came here, had a divorce in Belgium, saw an advertisement in the newspaper and made a solicitation. Five days later I had a job and a house in Rotterdam. I worked in a Moroccan project where we were doing research on why the Moroccan youth was not as involved in society as other foreign communities were. There was a special problem around the Moroccan kids. We wanted to understand why they were dropping out of society. The work happened in Coffee Shops. During that period, I wasn’t really satisfied with the work we were doing. There was lot of money involved in the research program and I was thinking “What are they going to do with all these data?” About the same time I went to a community center and there was a forum theatre play about racism. There were a lot of Moroccan young people that I knew. For me it was always a challenge to understand how to activate people, how to bring them into movement. Suddenly, I saw them in a forum on stage. I was puzzled and amazed. I didn’t have anything to do with theatre. I hated theatre. Theatre was from the bourgeois. The only play I saw in those days was the 4-hour French play Les Miserable and that was quite miserable. I think I fell asleep. But here I saw a pedagogical tool. Two months later, I had the chance to go to Switzerland and to see Boal in a TO workshop. After 5 days of Boal I came back and knew “This is what I want to do.” I quit my job and I started to make theatre. Later on, I discovered that I knew a little bit about the oppressed and about oppression but the word theatre scared me. I didn’t know anything about theatre. So I started to do theatre studies and became a director of contemporary theatre with amateurs, with non-actors. I learned how to make a nice play. I won some festivals during that period here in Rotterdam and in other cities. After my studies I focused entirely on Theatre of the Oppressed. I always stayed in connection with Boal and Formaat exists for about 15 years now. Together with Boal and many practitioners, we dreamed of an International Theatre of the Oppressed movement or organization. We started to collect data from all over the world about which groups work where, with what, with whom. And we started the Yellow Pages. That’s how I got involved. R: Formaat has gone through some big changes recently. Just in a few words, what is Formaat for you and what do you think it is for the community you work with? L: Formaat is a workspace in the first place. It’s where people come together and work on questions they have about their own lives or the lives of their community. They share stories, make plays about them and go back to their community to question the play and the community. We worked with people with psychiatric backgrounds. We reached about 50 people with psychiatric diagnosis, addiction to drugs and everything that comes with it. We still have two groups of people with learning disabilities. Thamar is working with people in the neighborhood. In this neighborhood, one of four people is living around the poverty line. We also have a 70+ senior group. They are people who are starting to be in need of aid and feel lonely in society because everything is too quick for them. Besides that, we try to stimulate people in the Netherlands to use participatory tools. Basically, it’s a place where communities meet, create and go in dialogue with those who want to go in dialogue with them. T: …yes, knowledge and training ourselves. The whole heritage of Boal is serving us a lot. R: You, as Formaat, have contributed to the TO network with many attempts of structuring the collective exchange, making work visible and inviting to cooperation in the network. Examples are the Yellow Pages, the newsletter but also the Panel for Peace webcasts you share online. Earlier today you [Thamar] said that concerning the community of TO practitioners “we are all on our own islands”. Is there something you could wish for that the international community or the network could do to help each other in situations of individual struggle? L: I think the international community is already supporting us by showing its solidarity. David Diamond is here with us now, Hector Aristizabal comes next month. This is helping us in our struggle to show the Dutch society how important these tools are for society. It’s a big act of solidarity to come here as practitioners and to share your knowledge. We have that image of an open box filled with all the knowledge. It’s filled by everybody in the movement. It’s filled by Hector, it’s filled by David, it’s filled by Marc [Marc Weinberg], it’s filled by Barbara [Barbara Santos], by Sanjoy Ganguly. They all drop their knowledge in the box. Our participants can take out that knowledge and go fighting their struggles with their communities. In a certain sense we are facilitating the communities with that knowledge. Now, for example, there are a lot of Jokers going to Ukraine [Theater for Dialogue]. That is an act of solidarity towards Formaat; being part of that bigger movement is an act of solidarity. It’s true that we all have our islands but from those islands I get a lot of messages of solidarity towards our work. T: Actually, I don’t. There is a lot of connection between people who actually knew Boal and learned the work from him. But there is a “next generation” and I noticed that there are a lot of people trying to do this work and feeling really insecure about doing it. I think this is what I mean referring to the islands. There are a lot of people doing TO and many don’t feel comfortable enough to share their work with each or maybe they don’t have the time. They don’t go and watch each other and say “These are the things that we have to deal with…how do you deal with this?” I think there is still a lot to gain in the community. R: What would you wish for? T: To have a space where the work can be developed together. Of course, everybody is working in his own space but there must be some kind of connection to develop it further. L: Don’t you think that we - I, David and Hector, the people you are referring to, the people that knew Boal – let’s call it first generation - didn’t go through this journey as well? This first generation of jokers, who is now practicing for 20 years, travelled on a road of insecurity. I remember me asking Boal questions like “Can I do this? Can I do that?” The same way there are now young practitioners asking me “Can I do this? Can I do that?” Boal always responded: “Why do you ask me questions about stuff that you already do?” I mean, if you call your center “Center of Theatre of the Oppressed” you already are a “Center of Theatre of the Oppressed”. I think the road to become a joker is a very uncertain road. You don’t know what you’re going to bump into. And that’s part of becoming a Joker. T: I just hope that this insecurity doesn’t block people, doesn’t block us from developing the work together. I think the danger is that the essential thing is going to escape, that everybody does his own thing losing the connection with the original work. That’s something we all have to be aware of. R: Recently I have noticed a lot of interest in building a young practitioners TO-network to share experiences and to work with those insecurities. What’s your feeling about that? T: For me it doesn’t have to be separated. L: It’s crazy. Are we going to create Theatre of the Oppressed for a second generation? Are we going to create a separate one for the fight against homophobia, maybe homosexuals or women? While you were asking I was thinking “Oh, here we got a new circle again!” It’s an interesting question and I think the second generation - to keep that term alive a little bit - is connecting with each other out of insecurity. T: That’s exactly what I felt these days. I think we have to get over that because this way we all are losing. You need to gain experience but if that means fighting each other and blocking ourselves, then we have a big problem. R: So what do you see as the biggest challenge for TO at the moment – in terms of practice and in terms of the community? L: I think we have to create spaces where we can learn from each other. That’s why we came up with the idea of the masterclasses, which allow us to bring knowledge from abroad and share it with others. It is for about 5/6 years now that practitioners come twice a year to share their knowledge. The most important thing I learned is that we have to break our dogmatism. That’s the challenge. We have to look over the fence. We have to see what other people are doing, what they discover, and understand how that can be used in our own work. In Formaat, we have developed a lot of experience in implementing projects and sharing tools with people that have a background of drug addiction. I am sure they could be used in many countries. Another challenge is that not so many groups work with communities. There are a lot of practitioners training other trainers. That’s fine with me but the actual work needs to be in the community itself. 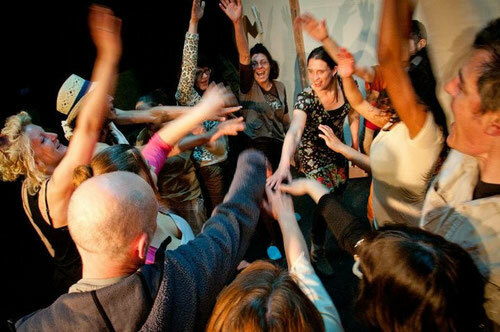 It’s Theatre of the Oppressed – so the community needs to receive the tools to work with them. I am very proud that now some of our workshop participants start to do the exercises themselves. When we work with people with learning disabilities and suddenly someone of the group comes up in front and starts the first exercise, then you see people being very surprised. So I agree with Thamar, we must create a lot space for sharing knowledge because knowledge is what we have. T: Yes, spaces where experiences are shared but where there is also room to explore. I think that’s something we have to add to the masterclasses. A masterclass is about sharing your experience but there is no space for exploration. I think becoming a joker is mainly about experiencing. That’s what my journey is about. If I look back at the work when I begun I think “Uuuh, this was really bad.” And then, step by step, you start to think “Ok, now I know this, now I know that.” So you need the experience to get better. L: And you have to be entitled to make mistakes because in TO we celebrate mistakes. T: I think when you do a project, the essential question is not “What do you do?” but “Why do you do it?” Why do you work with these people on those subjects? Ask yourself over and over again with the support of people who have the experience to guide you through it. R: Thanks a lot for this interview!